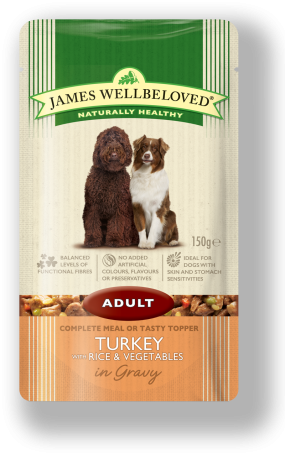 Carefully crafted and nutritionally balanced complete wet dog food for the health and wellbeing of adult dogs from 12 months to 7 years. Using all our knowledge and experience, we’ve created James Wellbeloved Grain Free Turkey Adult with Vegetables wet pouches. We take a handful of ingredients from nature, one source of animal protein and combine them with all the vitamins and minerals your dog needs. And all the great taste it deserves. For added peace of mind, it’s naturally hypoallergenic so less likely to cause an adverse food reaction and you will never see any added artificial colours, flavours or preservatives. Not now, not ever. Additives per kg: Vitamins: E671/Vitamin D3 (147 iu). Trace elements: E1/iron (2.1mg), E2/iodine (0.08mg), E4/copper (6.8mg), E5/manganese (1.2mg), E6/zinc (46mg). Recommended by vet, and dogs seem to love it. Easy for them to digest. The dog's love it, one dog was reluctant to eat, now he can't wait. I WOULD GIVE THIS 5 STARS IF IT WOULD MAKE CAESAR EAT HIS FOOD WHEN IT WAS GIVEN TO HIM. HE HAS ALWAYS 'GRAZED' UNLIKE HIS SISTER WHO EATS STRAIGHT AWAY. 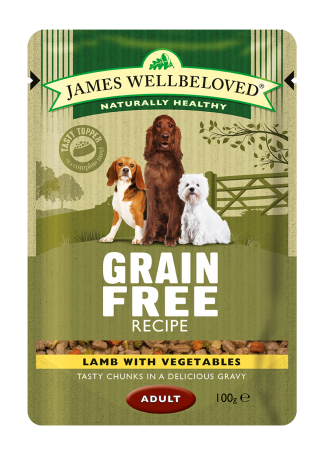 HE HAS THIS MIXED WITH HIS DRY FOOD - JAMES WELLBELOVED OF COURSE - AS IT MAKES HIM EAT JUST A BIT QUICKER!! My dog Ted has been having James Wellbeloved pouches for years and it always seems to go down well.